I use these spoons when cooking and they are great for stirring coffee, hot chocolate, and milk flavorings. They are light weight and easy to use for all, look very good on a set up tray for ice tea. I would order again. I was looking for long-handled ice-tea spoons for use in tall glasses with tea and smoothies. The simple design compliments any style. They were very affordable. Just what I was looking for. I just needed some extra teaspoons because some of mine were lost. These were pretty and sturdy. you can never have enough iced tea spoons! I had bought these several years ago and they were useful for several things. I liked using them to reach the bottom of a tall glass of cornbread and milk. I misplaced them while packing to move after my husband passed away earlier this year, so I reordered them. These were perfect for us. They are great for ice cream sodas & floats. Also good for getting to the bottom of jars. They were dull when we received them, but after washing them in the dishwasher, they came out very shiny. My husband & I love them. My Dad even had me give him one! So glad I found these years ago in your catalogue. My everyday glasses are tall and slim and these spoons are just perfect. I recently bought another set because a couple of my old ones got "lost". They're also great for large jars like peanut butter, pickles, ice tea canisters, etc. The long handled tea spoons were exactly what I was looking for at a low price! Plus they showed up quickly! Thank you! All products were exactly what I expected. ?? 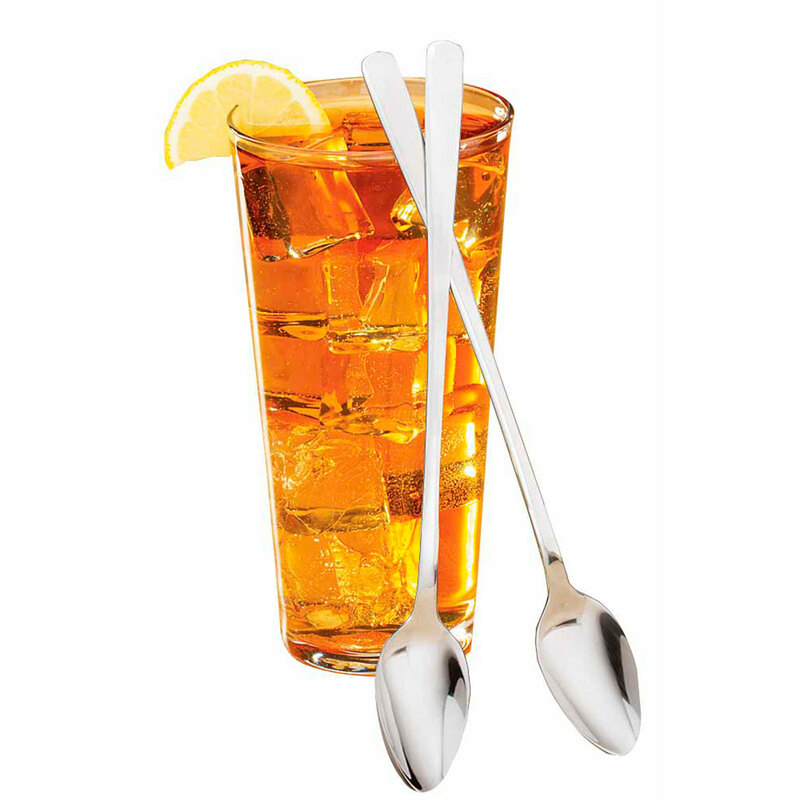 These iced tea spoons are very simple, will go with any decor, and are affordable and functional. I'm glad I found them. You can never seem to have enough of these for tall glasses of iced tea in the summer! I'll use these regularly! Very handy, fits the bill! I was so disappointed that the extremely well-known, highly reputable manufacturer of my beautiful new stainless pattern didn't include or even make iced tea spoons for that pattern! And frustrated, too - trying to find something else to substitute was a bomb - most were "too fancy" since mine is a very plain, simple pattern. This spoon is just the ticket! A bit "softer", more "bendable" than my high-priced stuff, but not much of a worry considering its biggest job is stirring iced tea (or a mojito or mint julep, heh heh)! And the price is VERY comfortable! I'm happy! the will be handy for ice cream floats and ice tea. Don't know how they will fit into our silverware holder, but will not have to use them that much . Will be easy to store as they are compactly packaged. Got these for our daughter as she has grandchilden who will benefit using them. Handicapped, hands bad, needed more length, works well. Bowl of spoon kind of small. I have very deep TALL coffee mugs and these are perfect (a regular length spoon would disappear into the coffee or tea inside). Also terrific for deep parfait glasses! These iced-beverage spoons are nice for casual parties or patio dining where I don't want to use my good silverware. They are lightweight, and the finish is "wavy." No one is going to mistake them for heirloom flatware! However, I don't like using plastic spoons, especially for guests. These are a nice compromise. I have looked every where for long tea spoons and could not find them any where. I was so glad to see these at kimball's. I ordered them, I think they are great for alot of things, not just tea. They are not fancy and alittle thin, but sundies, floats, milk shakes etc. I think they are great. I use them for alot of other things too, like getting peanut butter or mayo out of a large jar. Well, anyway I think they are great and I am glad I ordered them. Spoons are a bit thick and klunky but for the price they are better than might be expected. I had been looking for Iced Tea Spoons for quite a while until I saw them in your catalog. They are not as sturday as the ones I now have at home but for casual use they are great. Use for dessert spoons as I serve from tall glasses but these are not exceptional and the price was too much! Would not buy again at this price. I had been looking for some inexpensive tea spoons for some time when I saw these MK catalog. The price was right, so I ordered them immediately, but was disappointed in how flimsy and delicate they were. All my flatware is really heavy duty and I guess I was looking for the same thing in these spoons. If you aren't bothered by the weight of these then they would be a good addition to your long handled teas. For me they just weren't what I wanted. They will bend easily and if you have kids they wouldn't last long at all. Great as an ice tea or drink spoon. I wanted them to use to eat oatmeal out of my tall coffee cup as I'm commuting. The spoon doesn't hold much but it does the job. These are light weight, cafeteria quality spoons. Extremely plain design. No embellishments. But they do the job intended and are reasonably durable. Not for a fine dinner setting, but a BBQ or family dinner they should be very usuable. I agree with another reviewer that these spoons are pretty weak. If you try to stir something thick and heavy, it feels like the spoon will bend very easily. I still like having them and use them frequently (but carefully). The Price was right so I am not totally dissatisfied. These spoons are very plain, and rather light weight, so all I can see using them for is iced tea. I enjoy using tea spoons for a variety of things. I have some left from years ago but these are not the same quality. It seems everything is made poorer than years ago. Must be a sign of the times. These are very flimsy and it seems they will bend under little pressure. I would not purchase again. VERY CHEAP CONSTRUCTION COMPARED TO OTHERS I HAVE PURCHASED. DON'T SPEND YOUR MONEY ON THESE. I wouldn't buy this item again.I sure wouldn't recommend it. I love the length of the spoons. I hate that the spoons are so flimsy. These would be okay for kids, but the spoon is so small, that it's useless for most adults. I've ordered these spoons before and what I got this time is a poor relation of the previous order. My previous order was shiney, strong and stylized. The spoons I received this time were exactly the opposite. They were dull, poorly made, flat and with no design what-so-ever. I would rather you raise the price than lower the quality. Save your money. I've been looking for some of these for a long time, and was glad when I saw them in your catalog. But was very dissapointed when I got them. 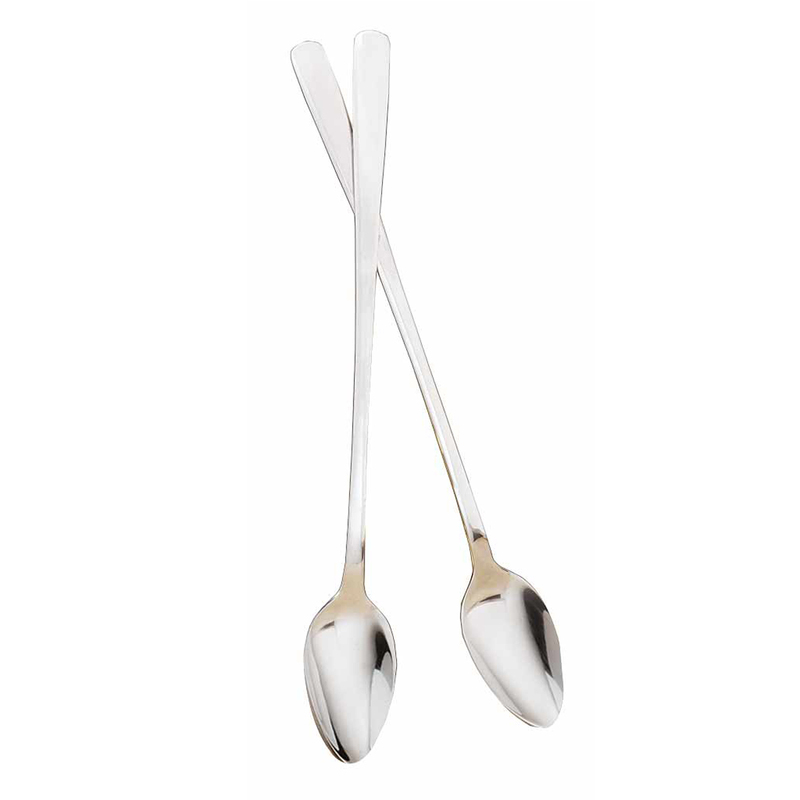 I'v been hunting for ice tea spoons that weren't in a silverware set for a long long time. Had given up. These make me very happy. I have never had a set...looking forward to using them in the Summer! l love the fact that my tea, coffee and cocoa are properly mixed with the extended handle. I have been trying to find tea spoons for a really long time--this is great! We had some that we lost. Very handy for getting to the bottom of jars --also to use in a tall glass for stirring. Don't currently have a complete set. Great for root beer floats. I had order a set before and Loved them They are strong enough to get peanut butter out of the jar. Needed a second set for a dinner party. These tea spoon are hard to find. Use them every morning for my coffee on the go cups. I liked the longer-than-normal size. I needed a few more. They are great for tall glass for stirring. Have tall glasses - for ice cream sodas. Also have tall stainless steel mugs for mixing hot tea with lemon. We needed more of these. I didn't have any long spoons like this. Needed long handled spoons for my root beer floats. I like this type of spoons and wanted more of them. 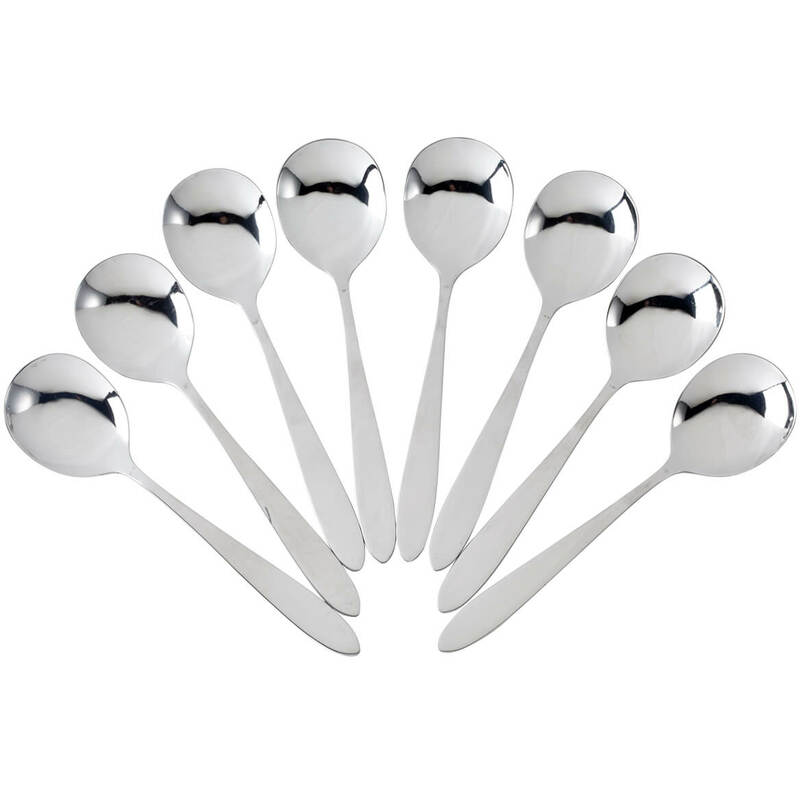 It's hard to find long tea spoons unless you purchase an entire set of flatware. walter Drake offered exactly what I wanted. I love them for my ice cream floats. 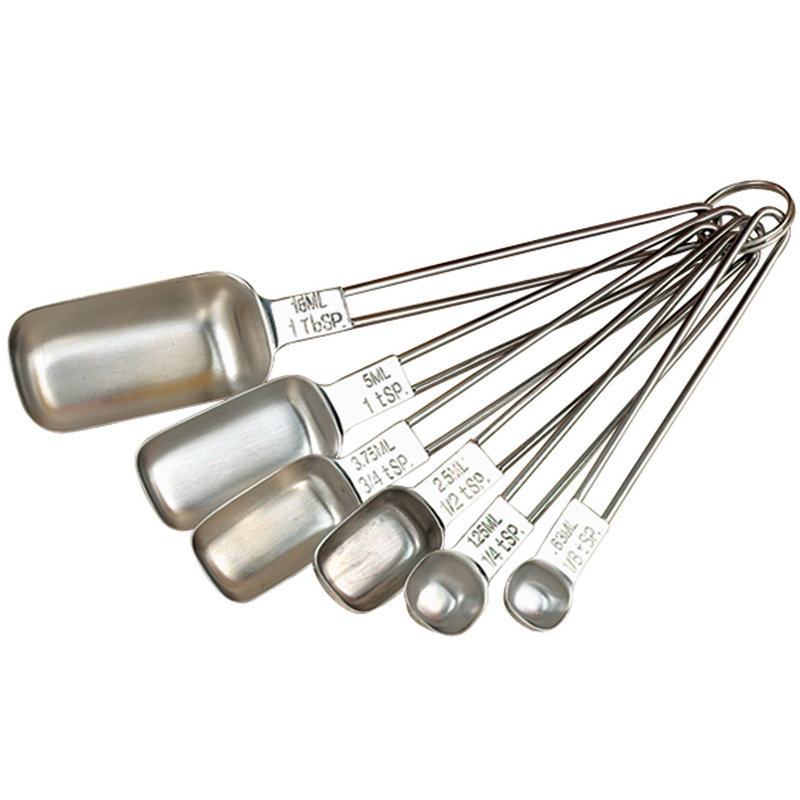 I use these teaspoons for iced tea & to access deep condiment jars; mayonnaise, etc. What is the spoon bowl size (width and length)? BEST ANSWER: Thank you for your question The spoons measure 8 1/2"Lx1"W. We hope this information will be of help to you. Hi Annette. I wanted to know the dimensions for just the spoon bowl, not the entire spoon. Can you provide me with this information? Thanks. This item is on sale in catalog but not here, why?